This article is about the modern state of Sachsen in present-day Germany. For other uses, see Saxony (disambiguation). Saxony (German: Sachsen, Upper Sorbian: Sakska), officially the Free State of Saxony[not in citation given] (German: Freistaat Sachsen [ˈfʁaɪ̯ʃtaːt ˈzaksn̩], Upper Sorbian: Swobodny stat Sakska), is a landlocked federal state of Germany, bordering the federal states of Brandenburg, Saxony Anhalt, Thuringia, and Bavaria, as well as the countries of Poland (Lower Silesian and Lubusz Voivodeships) and the Czech Republic (Karlovy Vary, Liberec, and Ústí nad Labem Regions). 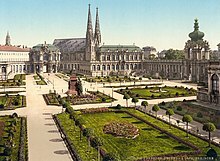 Its capital is Dresden, and its largest city is Leipzig. The history of the state of Saxony spans more than a millennium. It has been a medieval duchy, an electorate of the Holy Roman Empire, a kingdom, and twice a republic. The area of the modern state of Saxony should not be confused with Old Saxony, the area inhabited by Saxons. Old Saxony corresponds roughly to the modern German states of Lower Saxony, Saxony-Anhalt, and the Westphalian part of North Rhine-Westphalia. Saxony has, after Saxony Anhalt, the most vibrant economy of the states of the former East Germany (GDR). Its economy grew by 1.9% in 2010. Nonetheless, unemployment remains above the German average. The eastern part of Germany, excluding Berlin, qualifies as an "Objective 1" development-region within the European Union, and was eligible to receive investment subsidies up to 30% until 2013. FutureSAX, a business plan competition and entrepreneurial support organisation, has been in operation since 2002. Microchip-makers near Dresden have given the region the nickname "Silicon Saxony". The publishing and porcelain industries of the region are well known, although their contributions to the regional economy are no longer significant. Today, the automobile industry, machinery production, and services contribute to the economic development of the region. Saxony is also one of the most renowned tourist destinations in Germany - especially the cities of Leipzig and Dresden and their surroundings. New tourist destinations are developing, notably in the lake district of Lausitz. The Leipzig area, which until recently was among the regions with the highest unemployment rate, could benefit greatly from investments by Porsche and BMW. With the VW Phaeton factory in Dresden, and many parts suppliers, the automobile industry has again become one of the pillars of Saxon industry, as it was in the early 20th century. Zwickau is another major Volkswagen location. Freiberg, a former mining town, has emerged as a foremost location for solar technology. Dresden and some other regions of Saxony play a leading role in some areas of international biotechnology, such as electronic bioengineering. While these high-technology sectors do not yet offer a large number of jobs, they have stopped or even reversed the brain drain that was occurring until the early 2000s in many parts of Saxony. Regional universities have strengthened their positions by partnering with local industries. Unlike smaller towns, Dresden and Leipzig in the past experienced significant population growth. Dresden is the hub of Silicon Saxony. Mitteldeutscher Rundfunk is one of Germany's public broadcasters. Leipzig/Halle Airport is the main hub of DHL and the fifth-busiest airport in Europe in terms of cargo traffic. VNG – Verbundnetz Gas in Leipzig is the third-largest natural-gas importer in Germany. Saxony has a long history as a duchy, an electorate of the Holy Roman Empire (the Electorate of Saxony), and finally as a kingdom (the Kingdom of Saxony). In 1918, after Germany's defeat in World War I, its monarchy was overthrown and a republican form of government was established under the current name. The state was broken up into smaller units during communist rule (1949–1989), but was re-established on 3 October 1990 on the reunification of East and West Germany. In prehistoric times, the territory of Saxony was the site of some of the largest of the ancient central European monumental temples, dating from the fifth century BC. Notable archaeological sites have been discovered in Dresden and the villages of Eythra and Zwenkau near Leipzig. The Slavic and Germanic presence in the territory of today's Saxony is thought to have begun in the first century BC. The first medieval Duchy of Saxony was a late Early Middle Ages "Carolingian stem duchy", which emerged around the start of the 8th century AD and grew to include the greater part of Northern Germany, what are now the modern German states of Bremen, Hamburg, Lower Saxony, North Rhine-Westphalia, Schleswig-Holstein and Saxony-Anhalt. The Saxons converted to Christianity during this period. While the Saxons were facing pressure from Charlemagne's Franks, they were also facing a westward push by Slavs to the east. The territory of the Free State of Saxony, called White Serbia was, since the 5th century, populated by Slavs before being conquered by Germans e.g. Saxons and Thuringii. A legacy of this period is the Sorb population in Saxony. Eastern parts of present Saxony were ruled by Poland between 1002 and 1032 and by Bohemia since 1293. The territory of the Free State of Saxony became part of the Holy Roman Empire by the 10th century, when the dukes of Saxony were also kings (or emperors) of the Holy Roman Empire, comprising the Ottonian, or Saxon, Dynasty. Around this time, the Billungs, a Saxon noble family, received extensive fields in Saxony. The emperor eventually gave them the title of dukes of Saxony. After Duke Magnus died in 1106, causing the extinction of the male line of Billungs, oversight of the duchy was given to Lothar of Supplinburg, who also became emperor for a short time. In 1137, control of Saxony passed to the Guelph dynasty, descendants of Wulfhild Billung, eldest daughter of the last Billung duke, and the daughter of Lothar of Supplinburg. In 1180 large portions west of the Weser were ceded to the Bishops of Cologne, while some central parts between the Weser and the Elbe remained with the Guelphs, becoming later the Duchy of Brunswick-Lüneburg. The remaining eastern lands, together with the title of Duke of Saxony, passed to an Ascanian dynasty (descended from Eilika Billung, Wulfhild's younger sister) and were divided in 1260 into the two small states of Saxe-Lauenburg and Saxe-Wittenberg. The former state was also named Lower Saxony, the latter Upper Saxony, thence the later names of the two Imperial Circles Saxe-Lauenburg and Saxe-Wittenberg. Both claimed the Saxon electoral privilege for themselves, but the Golden Bull of 1356 accepted only Wittenberg's claim, with Lauenburg nevertheless continuing to maintain its claim. In 1422, when the Saxon electoral line of the Ascanians became extinct, the Ascanian Eric V of Saxe-Lauenburg tried to reunite the Saxon duchies. However, Sigismund, King of the Romans, had already granted Margrave Frederick IV the Warlike of Meissen (House of Wettin) an expectancy of the Saxon electorate in order to remunerate his military support. On 1 August 1425 Sigismund enfeoffed the Wettinian Frederick as Prince-Elector of Saxony, despite the protests of Eric V. Thus the Saxon territories remained permanently separated. The Electorate of Saxony was then merged with the much bigger Wettinian Margraviate of Meissen, however using the higher-ranking name Electorate of Saxony and even the Ascanian coat-of-arms for the entire monarchy. Thus Saxony came to include Dresden and Meissen. In the 18th and 19th centuries Saxe-Lauenburg was colloquially called the Duchy of Lauenburg, which in 1876 merged with Prussia as the Duchy of Lauenburg district. Saxony-Wittenberg, in modern Saxony-Anhalt, became subject to the margravate of Meissen, ruled by the Wettin dynasty in 1423. This established a new and powerful state, occupying large portions of the present Free State of Saxony, Thuringia, Saxony-Anhalt and Bavaria (Coburg and its environs). Although the centre of this state was far to the southeast of the former Saxony, it came to be referred to as Upper Saxony and then simply Saxony, while the former Saxon territories were now known as Lower Saxony. 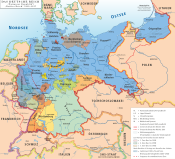 In 1485, Saxony was split. A collateral line of the Wettin princes received what later became Thuringia and founded several small states there (see Ernestine duchies). The remaining Saxon state became still more powerful and was known in the 18th century for its cultural achievements, although it was politically weaker than Prussia and Austria, states which oppressed Saxony from the north and south, respectively. Between 1697 and 1763, the Electors of Saxony were also elected Kings of Poland in personal union. In 1756, Saxony joined a coalition of Austria, France and Russia against Prussia. Frederick II of Prussia chose to attack preemptively and invaded Saxony in August 1756, precipitating the Third Silesian War (part of the Seven Years' War). The Prussians quickly defeated Saxony and incorporated the Saxon army into the Prussian army. At the end of the Seven Years' War, Saxony recovered its independence in the 1763 Treaty of Hubertusburg. In 1806, French Emperor Napoleon abolished the Holy Roman Empire and established the Electorate of Saxony as a kingdom in exchange for military support. The Elector Frederick Augustus III accordingly became King Frederick Augustus I of Saxony. Frederick Augustus remained loyal to Napoleon during the wars that swept Europe in the following years; he was taken prisoner and his territories declared forfeit by the allies in 1813, after the defeat of Napoleon. Prussia intended the annexation of Saxony but the opposition of Austria, France, and the United Kingdom to this plan resulted in the restoration of Frederick Augustus to his throne at the Congress of Vienna although he was forced to cede the northern part of the kingdom to Prussia. These lands became the Prussian province of Saxony, now incorporated in the modern state of Saxony-Anhalt except westernmost part around Bad Langensalza now in the one of Thuringia. Also Lower Lusatia became part of Province of Brandenburg and northeastern part of Upper Lusatia became part of Silesia Province. The remnant of the Kingdom of Saxony was roughly identical with the present federal state, albeit slightly smaller. Meanwhile, in 1815, the southern part of Saxony, now called the "State of Saxony" joined the German Confederation. (This German Confederation should not be confused with the North German Confederation mentioned below.) In the politics of the Confederation, Saxony was overshadowed by Prussia. King Anthony of Saxony came to the throne of Saxony in 1827. Shortly thereafter, liberal pressures in Saxony mounted and broke out in revolt during 1830—a year of revolution in Europe. The revolution in Saxony resulted in a constitution for the State of Saxony that served as the basis for its government until 1918. During the 1848–49 constitutionalist revolutions in Germany, Saxony became a hotbed of revolutionaries, with anarchists such as Mikhail Bakunin and democrats including Richard Wagner and Gottfried Semper taking part in the May Uprising in Dresden in 1849. (Scenes of Richard Wagner's participation in the May 1849 uprising in Dresden are depicted in the 1983 movie Wagner starring Richard Burton as Richard Wagner.) The May uprising in Dresden forced King Frederick Augustus II of Saxony to concede further reforms to the Saxon government. In 1854 Frederick Augustus II's brother, King John of Saxony, succeeded to the throne. A scholar, King John translated Dante. King John followed a federalistic and pro-Austrian policy throughout the early 1860s until the outbreak of the Austro-Prussian War. During that war, Prussian troops overran Saxony without resistance and then invaded Austrian (today's Czech) Bohemia. After the war, Saxony was forced to pay an indemnity and to join the North German Confederation in 1867. Under the terms of the North German Confederation, Prussia took over control of the Saxon postal system, railroads, military and foreign affairs. In the Franco-Prussian War of 1870, Saxon troops fought together with Prussian and other German troops against France. In 1871, Saxony joined the newly formed German Empire. 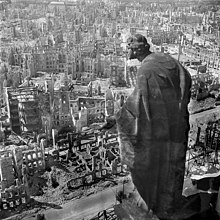 Dresden in ruins. After World War II, over 90 percent of the city centre was destroyed. After King Frederick Augustus III of Saxony abdicated on 13 November 1918, Saxony, remaining a constituent state of Germany (Weimar Republic), became the Free State of Saxony under a new constitution enacted on 1 November 1920. In October 1923 the federal government under Chancellor Gustav Stresemann overthrew the legally elected SPD-Communist coalition government of Saxony. The state retained its name and borders during the Nazi era as a Gau (Gau Saxony), but lost its quasi-autonomous status and its parliamentary democracy. As World War II drew to its end, U.S. troops under General George Patton occupied the western part of Saxony in April 1945, while Soviet troops occupied the eastern part. That summer, the entire state was handed over to Soviet forces as agreed in the London Protocol of September 1944. Britain, the US, and the USSR then negotiated Germany's future at the Potsdam Conference. Under the Potsdam Agreement, all German territory East of the Oder-Neisse line was annexed by Poland and the Soviet Union, and, unlike in the aftermath of World War I, the annexing powers were allowed to expel the inhabitants. During the following three years, Poland and Czechoslovakia forcibly expelled German-speaking people from their territories, and some of these expellees came to Saxony. Only a small area of Saxony lying east of the Neisse River and centred around the town of Reichenau (now called Bogatynia), was annexed by Poland. The Soviet Military Administration in Germany (SVAG) merged that very small part of the Prussian province of Lower Silesia that remained in Germany with Saxony. On 20 October 1946, SVAG organised elections for the Saxon state parliament (Landtag), but many people were arbitrarily excluded from candidacy and suffrage, and the Soviet Union openly supported the Socialist Unity Party of Germany (SED). The new minister-president Rudolf Friedrichs (SED), had been a member of the SPD until April 1946. He met his Bavarian counterparts in the U.S. zone of occupation in October 1946 and May 1947, but died suddenly in mysterious circumstances the following month. He was succeeded by Max Seydewitz, a loyal follower of Joseph Stalin. The German Democratic Republic (East Germany), including Saxony, was established in 1949 out of the Soviet zone of Occupied Germany, becoming a constitutionally socialist state, part of COMECON and the Warsaw Pact, under the leadership of the SED. In 1952 the government abolished the Free State of Saxony, and divided its territory into three Bezirke: Leipzig, Dresden, and Karl-Marx-Stadt (formerly and currently Chemnitz). Areas around Hoyerswerda were also part of the Cottbus Bezirk. The Free State of Saxony was reconstituted with slightly altered borders in 1990, following German reunification. Besides the formerly Silesian area of Saxony, which was mostly included in the territory of the new Saxony, the free state gained further areas north of Leipzig that had belonged to Saxony-Anhalt since 1952. The Electoral Saxony, a predecessor of today's Saxony, was the original birthplace of the Reformation. The elector was Lutheran starting in 1525. The Lutheran church was organized through the late 1510s and the early 1520s. It was officially established in 1527 by John the Steadfast. Although some of the sites associated with Martin Luther also lie in the current state of Saxony-Anhalt (including Wittenberg, Eisleben and Mansfeld), today's Saxony is usually viewed as the formal successor to what used to be Luther's country back in the 16th century (i.e. the Electoral Saxony). Martin Luther personally oversaw the Lutheran church in Saxony and shaped it consistently with his own views and ideas. The 16th, 17th and 18th centuries were heavily dominated by Lutheran orthodoxy. In addition, the Reformed faith made inroads with the so-called crypto Calvinists, but was strongly persecuted in an overwhelmingly Lutheran state. In the 17th century, Pietism became an important influence. In the 18th century, the Moravian Church was set up on Count von Zinzendorf's property at Herrnhut. From 1525, the rulers were traditionally Lutheran and widely acknowledged as defenders of the Protestant faith, although – beginning with Augustus II the Strong, who was required to convert to Roman Catholicism in 1697 in order to become King of Poland – its monarchs were exclusively Roman Catholic. That meant Augustus and the subsequent Kings of Saxony, who were Roman Catholic, ruled over a state with an almost entirely Protestant population. In 1925, 90.3% of the Saxon population was Protestant, 3.6% was Roman Catholic, 0.4% was Jewish and 5.7% was placed in other religious categories. After World War II, Saxony was incorporated into East Germany which pursued a policy of state atheism. After 45 years of Communist rule, the majority of the population has become unaffiliated. As of 2011, the Evangelical Church in Germany represented the largest faith in the state, adhered to by 21.4% of the population. Members of the Roman Catholic Church formed a minority of 3.8%. About 0.9% of the Saxons belonged to an Evangelical free church (Evangelische Freikirche, i.e. various Protestants outside the EKD), 0.3% to Orthodox churches and 1% to other religious communities, while 72.6% did not belong to any public-law religious society. Boundary sign of Bautzen / Budyšin in German and Upper Sorbian; many place names in eastern Saxony are derived from Sorbian. The most common patois spoken in Saxony are combined in the group of "Thuringian and Upper Saxon dialects". Due to the inexact use of the term "Saxon dialects" in colloquial language, the Upper Saxon attribute has been added to distinguish it from Old Saxon and Low Saxon. Other German dialects spoken in Saxony are the dialects of the Erzgebirge (Ore Mountains), which have been affected by Upper Saxon dialects, and the dialects of the Vogtland, which are more affected by the East Franconian languages. Upper Sorbian (a Slavic language) is still actively spoken in the parts of Upper Lusatia that are inhabited by the Sorbian minority. The Germans in Upper Lusatia speak distinct dialects of their own (Lusatian dialects). Saxony has four large universities and five Fachhochschulen or Universities of Applied Sciences. The Dresden University of Technology, founded in 1828, is one of Germany's oldest universities and University of Applied Sciences, Zwickau founded in 1897 With 36,066 students as of 2010, it is the largest university in Saxony and one of the ten largest universities in Germany. It is a member of TU9, a consortium of nine leading German Institutes of Technology. Leipzig University is one of the oldest universities in the world and the second-oldest university (by consecutive years of existence) in Germany, founded in 1409. Famous alumni include Leibniz, Goethe, Ranke, Nietzsche, Wagner, Angela Merkel, Raila Odinga, Tycho Brahe, and nine Nobel laureates are associated with this university. Saxony is a well known tourist destination. Dresden and Leipzig are two of Germany's most visited cities. Areas along the border with the Czech Republic, such as the Lusatian Mountains, Ore Mountains, Saxon Switzerland, and Vogtland, attract significant visitors, largely Germans. Saxony has well-preserved historic towns such as Meissen, Freiberg, Pirna, Bautzen, and Görlitz. Dresden Frauenkirche. It now serves as a symbol of reconciliation between former warring enemies. A Minister President heads the government of Saxony. Michael Kretschmer has been Minister President since 13 December 2017. See List of Ministers-President of Saxony for a full listing. ^ Statistisches Landesamt Baden-Württemberg. "Bruttoinlandsprodukt – in jeweiligen Preisen – in Deutschland 1991 bis 2014 nach Bundesländern (WZ 2008) – Volkswirtschaftliche Gesamtrechnungen der Länder VGR dL". Web.archive.org. Archived from the original on 17 December 2015. ^ "Free State of Saxony". Britannica.com. Retrieved 2014-10-17. ^ "Bevölkerung des Freistaates Sachsen jeweils am Monatsende ausgewählter Berichtsmonate nach Gemeinden" (PDF). Statistik.sachsen.de. 30 September 2017. Retrieved 9 August 2018. ^ Stadtplan.net. "Ballungsraum Leipzig/Halle". Stadtplan.net. Retrieved 5 November 2018. ^ eCommerce, Deutsche Bahn AG, Unternehmensbereich Personenverkehr, Marketing. "S-Bahn Mitteldeutschland". S-bahn-mitteldeutschland.de. Retrieved 5 November 2018. ^ "Flughafen Leipzig/Halle - Passengers and visitors > Flights > Flights". Leipzig-halle-airport.de. Retrieved 5 November 2018. ^ "Die Arbeitsmarkt im Juli 2014" (PDF). IHK Berlin. Archived from the original (PDF) on 17 October 2014. Retrieved 17 October 2014. ^ Freistaat Sachsen - Die angeforderte Seite existiert leider nicht Archived 30 July 2007 at the Wayback Machine. Smwa.sachsen.de. Retrieved on 2013-07-16. ^ "Still Troubled". The Economist. Retrieved 2014-08-25. ^ "EURES - Labour market information - Sachsen - European Commission". Ec.europa.eu. Retrieved 5 November 2018. ^ "Arbeitslosenquote nach Bundesländern in Deutschland 2018". De.statista.com. Retrieved 5 November 2018. ^ "Arbeitslosenquote in Deutschland nach Bundesländern 2013". De.statista.com. Retrieved 2013-07-16. ^ "Zensus 2014: Bevölkerung" (PDF). German Statistical Office. 31 December 2014. ^ "Geburten je Frau im Freistaat Sachsen 1990–2010" (PDF). Demografie.saschen.de. Retrieved 2014-10-21. This page was last edited on 13 April 2019, at 10:14 (UTC).